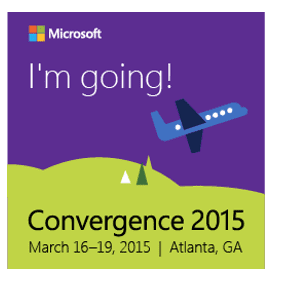 The Microsoft Convergence 2015 Conference in Atlanta, GA is nearly upon us. As you double check your registration and travel arrangements and burn the midnight oil to prepare to be out of the office for a week, we want to offer a few tips for when you get to Convergence in Atlanta to make your experience a great one. If you want to just bypass this entire blog post (not recommended) you can also watch our quick webcast on “A Hitchhikers Guide to Convergence 2015” Andy Kluck and I put together. The Hatsfield-Jackson Atlanta International Airport is about 10 miles from the Georgia World Congress Center, the home of Convergence 2015. To get to the downtown area where the conference hotels are located you have a few options. Taxi: Approx. $30-$40+ each way (start your networking at the cab stand and share a cab)! MARTA: Approximately $2.75 each way. Take train North to the Five Points Station. Take a Westbound train 1 stop to CNN/GWCC Station. Heading BACK to the Airport: Convergence will be offering non-stop airport service from the GWCC to the Aiport on Thursday, March 19, 2015 for the cost of $20 per person between 8:30am -5pm. As long as you have a full conference pass you can access and utilize the scheduler builder. There are lots of amazing sessions and the best tip is to come organized and prepared for which sessions you plan to attend but it is also great to allow for a bit of flexibility at this conference. The convergence app is accessible for everyone and will be your “go-to” app at the conference. You can access venue maps, the schedule builder, receive announcements, complete evaluations and much more. Be Prepared – download it today! With over 300 exhibitors throughout the expo hall, you could spend the entire week of Convergence seeing the amazing product and service offerings they provide. The expo hall will be open for 25 hours during the week with Monday being the largest window of opportunity to visit with these companies. Monday you can also take advantage of some (free) food and beverages from host exhibitors from 6pm-8pm during the Expo Experience Reception. Since I am writing this blog, I of course am going to promote stopping by the Ledgeview Partners’ booth #1322 to see our Microsoft Dynamics CRM vertical product solutions for Manufacturing and Distribution as well as our custom iPad app. And while you are there, get a really cool “A CRM experience you won’t expect” t-shirt and say hi the team. Let me know you read the blog! By now, I am sure your email box has been flooded with invitations to attend evening company events. If you are looking for the best ‘master list’ out there, check out Jamie Miley’s Convergence Party List. One of just many events, Ledgeview Partners will be hosting our happy hour at Legal Sea Foods on Tuesday night so swing by #1322 for a pass to attend but also one of the coolest events is #Geekvergence on Monday night. That one is pretty sweet. One of the best opportunities at Convergence is the networking. Even though we live in a digital age I highly encourage you to bring business cards. It might be old fashioned but so is a handshake and we still do that. If that just isn’t your thing or you unpack your bags and find yourself without, there will be a QR code on the conference badges (for those who chose that option) so you can easily use your smart phone to scan and share contact details. Whether you are on the shuttle bus, waiting for a session to start, chillin’ in front of the media wall or just having lunch, introduce yourself. Convergence isn’t the time to be shy, but is a GREAT way to make new friends and build your peer network. No need for your laptop – lots of computers available. It’s “Business Casual” but dress in whatever way you feel is appropriate and comfortable. Wear comfortable shoes. The conference center is large and a lot of walking, not much for padding on show floor. All session PowerPoints are made available to you through a website after the conference. So don’t feel like you have to feverishly be taking notes. Convergence has dedicated room for WiFi available during conference hours. Note Public area WiFi available, but with so many attendees signal could be sketchy. Your conference guide will have the network name and password to access. Option: Walk through Olympic Centennial Park is quick and nice. Stay connected with the latest Convergence buzz and make your co-workers jealous who didn’t get to attend by using #CONV15 to share content (pictures encouraged), join the conversation, ask questions or just comment. I know @ledgeviewcrm is going to be tweeting quite a bit about our experiencing both in and out of booth #1322! As promised, here is the video webcast that we recorded with this and much more information.